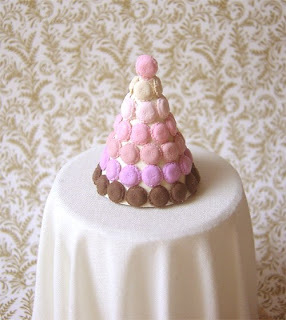 I first received an equiry last year if I make macaron tower in dollhouse 1:12 scale. At that time, I made macarons, but have never attempted making a tower yet. Early this year, I experimented and tried a few times, but I was not happy with the results. 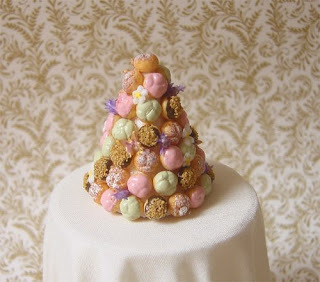 Personally this was definitely more challenging than the profiteroles tower. There weren't a lot of real macaron tower photographs that I could use as reference, so I had to depend on my imagination a lot. The next challenge was keeping the consistency of colours, deciding what colours I wanted. For a start, I made more than 10 different shades of a whole variety of colours, and each shade of 30 pieces at least. Then, I selected the colours that would look good together. This was the end result. A Pink Macaron Tower. :) Made with 60 macarons, it measures about 3.6cm tall and 2.8cm wide. These are some tips and personal experiences I would like to share with you on using Japanese resin air dry clay, based on my own trials and error. There are not many English tips on the internet for Japanese resin air dry clay and I hope this would be useful for you all. 1. Before buying, always press on the package to feel the hardness/softness of the clay. The fresher the clay, the softer it is. 2. I know the hard/soft part is not easy to gauge for a beginner especially if this is your first time buying/using them. But if you have already bought a harder packet of air dry clay by mistake, do not despair. Try using them for making cake shapes, cake decorations. (think of anything that is OK to dry quickly) Do not use them for intricate work such as flowers, pastries (anything that you want the texture to be obvious, or anything that you need more time to work on). When the clay is drier, any textures that you make on them will not stay on easily since resin clay by itself has a elastic feel during the process of drying. So whatever texture that you have put on, you will not get what you see upon drying. 3. Another tip is to take a little bit of the harder one to mix with a really soft wet pack of clay if you want something moderately easier to work with without getting too sticky. This is a really fabulous tip which I use it in the past. 5. You can use a high grade watercolour, acrylic colour or even oil paints to mix the colour into your clay. I have tried all 3 types (separately of course) and they all work well. 6. After you have mixed the clay with color, you must now store it while you use it a bit at a time. Always use cling wrap to wrap up the rest of the clay which you are not working on. Another recent top favourite way of mine is to store the colored clay into a ziplock bag. Only use what you need and store the rest of the colored clay into the ziplock bag. This helps to prevent it from drying out too quickly. 7. Always expect your work to shrink slightly after drying. 8. When leaving your work to dry, it might be good to leave it in a plastic tray or a non-stick mat to let it dry, as the wet clay might stick onto the table surface during the drying process. Therefore it is not a good idea to leave it on the table surface directly. Sometimes I turn it over after a day to let it dry on the other side. 9. Depending on where you live, humidity/weather conditions, it might take more than 1 day to dry the clay completely. 10. An entirely dried piece is hard, but you can always use a pen knife to cut through it. Well, I hope the above sharing will be useful for those who wish to try using the Japanese resin air dry clay. Personally I love them because they are so flexible, and there are so many ways to use them. Due to its versatility, there is really no hard and fast rule on using them. If you have any questions, please always feel free to leave me a comment below. Hope the above helps! Happy creating!